At least six persons, made up of a family of four and two others were burnt to death and about 25 houses and four vehicles parked around the scene were razed when a petrol tanker over turned at Igwuruta, in Ikwerre Local Government area, a suburb of Port Harcourt, the Rivers State, capital at about 4 a.m. today. Eyewitness said the tanker tried to turn, it skidded and fell, emptied its contents and caught fire. 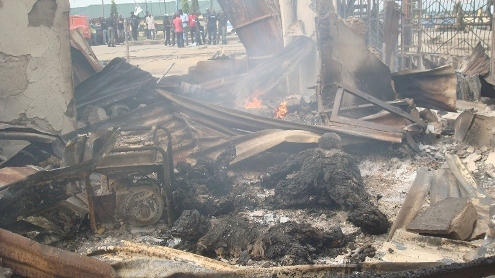 Due to what some angry inhabitants at Igwuruta perceived as the late arrival of fire-fighters at the scene of the accident, six of the officers were assaulted.They were said to have sustained injuries and were rushed to hospital.It was difficult assessing the extent of damage at the time of this report. Continue to read more and see uncensored picture...very graphic, be advised. 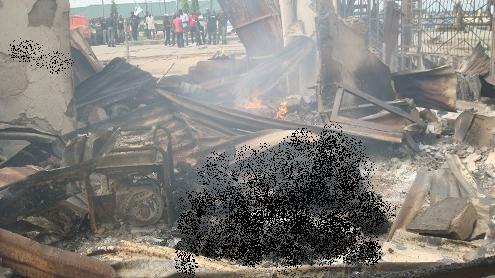 The new Rivers state Commissioner of Police, Mr.Ndabawa Mohammad who visited the scene of the accident confirmed that six people have been confirmed dead but described the accident as unfortunate.Emeka Worgu, the commissioner for Special Duties, who also visited the scene, regretted the waste of lives and property but described the assault on officers and men of the fire service as uncalled for. On his part, Mr Welendu Amadi, the Chairman of Ikwerre local government expressed disappointment that men of the fire service were beaten up for trying to do their job. He however promised that the Local government would assist the families of the victims of the disaster. Meanwhile, the accident created terrible traffic jam as it was difficult for those heading to the Port Harcourt International Airport and the Eastern part of Nigeria to make any headway. They spent several hours on the road.